TRY GRILLED CORN ON THE COB: Leave the husks on, and grill for about 30 minutes over medium flame, rotating occasionally. Remove from grill, let cool for about 5 minutes, remove husks and enjoy! 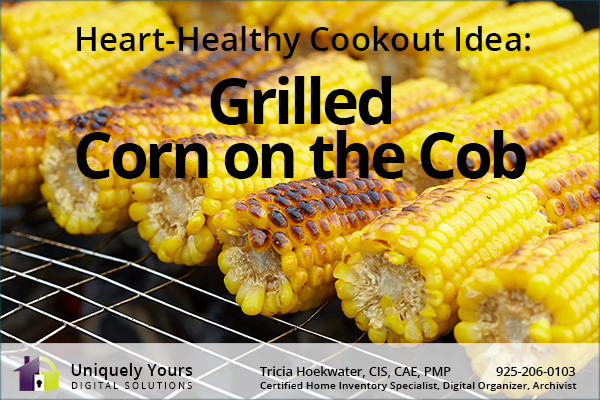 See more heart-healthy cookout ideas here: American Heart Association Heart-Healthy Cookout Ideas. When was the last time you updated your home inventory? Oh, wait! You don’t have one? Contact Tricia Hokewater now via phone at 925-206-0103 or by email uniquelyyours@outlook.com to schedule a new inventory or an update to your existing inventory.